Kids are fond of playground. 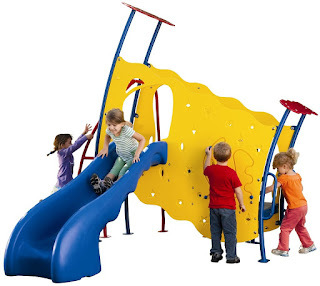 Playing with other children on play sets not is only fun but also beneficial for them. But playground also brings the risk of getting injured along with the enjoyment. Here are certain things that you must take care of to avoid serious injuries to kids. Children usually cross the safety line in trying out their imaginations on the commercial playground equipment. Hence, you should keep an eye on your kid while he or she is playing with other children on the play sets to prevent them from getting involved in unsafe activities. Not all play sets are made for every kid. Different factors like height and complexity are determined in the equipment after considering the age brackets. Also, National Program for Playground Safety has made it mandatory to build a separate location for equipment geared toward young children and older children. Ensure that your kid is playing on age-appropriate playground equipment. U.S. Consumer Product Safety Commission has stated that loose clothing or clothing with drawstrings face may catch on commercial playground equipment and result into serious injury to kids. Hence, you should avoid bringing your kids dressed in loose clothing or clothing with drawstrings face to the playground. You might be aware of the fact more than 60% of the playground injuries are due to falls from commercial play equipment. Ensure that highly quality rubber mulch is installed under and around play sets to provide cushioning surface to kids.